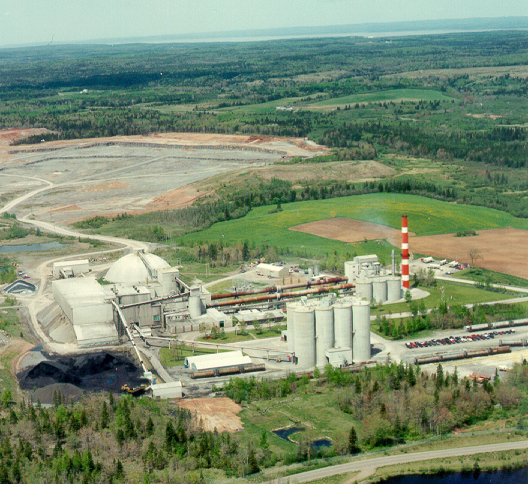 The Lafarge Canada Inc. Brookfield quarry site is located on a flat plain northwest of Shortts Lake. The quarry surface is about 30 m above mean sea level. We will provide you with a map of the area showing the location of the quarry and the nature and distribution of glacial deposits. 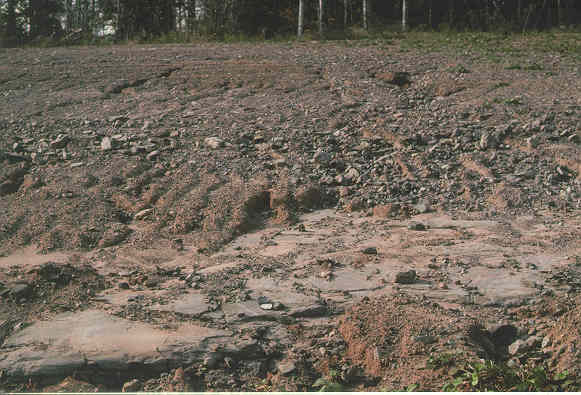 Summary for non-geologists: In this quarry you can find mud that was dumped in the bottom of large glacial lake called Glacial Lake Shubenacadie just before 12 ka (~14 CAL). We are getting close to the edge of the ice dam in the Minas Basin that caused the Shubenacadie River to back up like a bathtub whose drain was plugged. 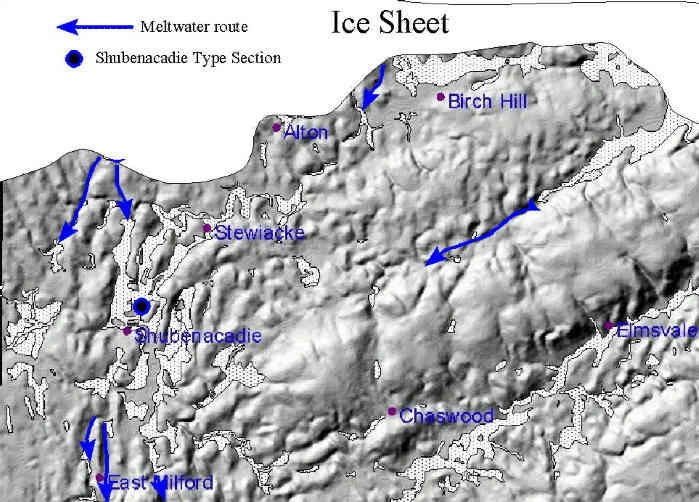 The Shubenacadie River Valley was filled with a glacial lake to elevations of 30 m. Shubenacadie Grand Lake near Halifax is all that's left of the former Glacial Lake Shubenacadie. 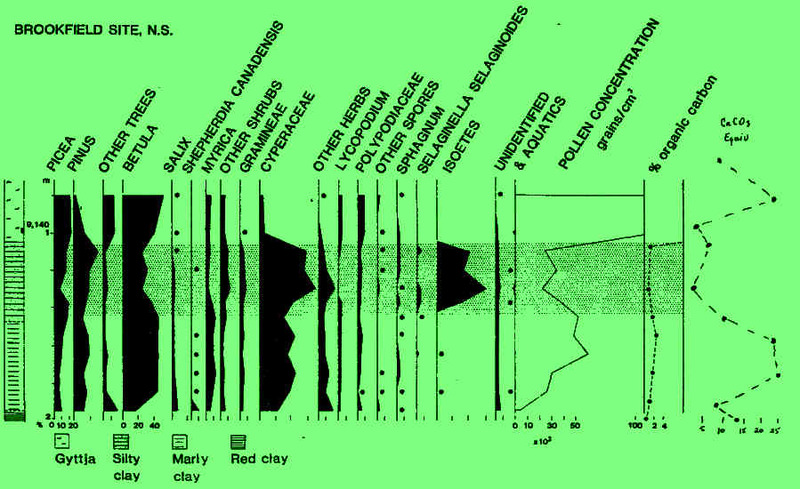 Quaternary stratigraphic sections in the Brookfield quarry were described by R. J. Mott and V. K. Prest in 1981 and by R.R. Stea in 1996. 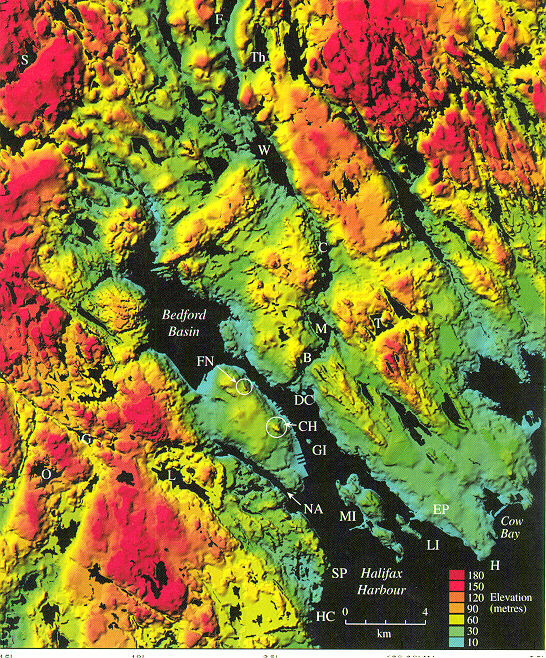 A compact reddish-brown till (Hants Till) is found at the base of the section overlying limestone bedrock inscribed with two sets of glacial striations, the older trending southeastward (152°) cut by a younger set trending due west (275°). 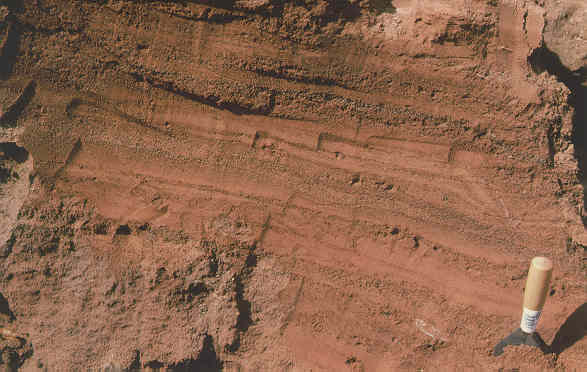 On top of the till are (Unit 1) rhythmically bedded, fine-grained sediments, beginning with couplets (varves) of coarse sand (and some ice-rafted boulders) and fine sand, grading upward into couplets of fine sand and silty clay. Vic Prest counted 200 varves in the section. Overlying the varves is a marly grey clay with shells (Unit 2). A wood fragment in this unit produced a radiocarbon date of 10.8 ka. This unit is overlain by an organic, grey silty clay with abundant wood, leaf and seed fragments (Unit 3). 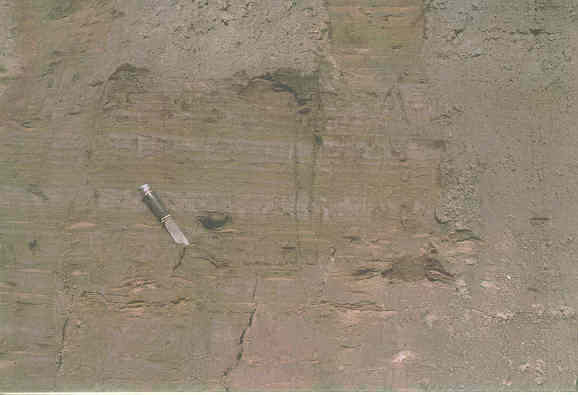 Unit 3 is overlain by a brownish-grey gyttja (organic lake sediment: Unit 4) with a radiocarbon date of 9.1 ka. The top unit (5) is a dark brown, mossy peat. An analysis of fossil pollen was completed on Units 2-5. See the pollen diagram. Unit 2 assemblages are characterized by moderate levels of Cyperaceae (sedge) and herb pollen and spores of Lycopodium (club moss), Pteridophyta (ferns), and Selaginella selaginoides. Pinus (pine) pollen may be over represented, due to its capability for long distance transport. Picea (spruce) levels increase above the base of the unit to a maximum of 11-15%. Pollen concentrations increase upsection in Unit 2. Unit 3 displays a decline in total pollen, and relative increases in sedge, herbs, and Isoetes (quillwort) and a significant decrease in total pollen percentages. Unit 4 returns to pollen percentages similar to Unit 2. The near absence of a significant thickness of pre-Younger Dryas organic sediment and lack of spruce pollen at this site compared to two sites only a few kilometres away suggest that the latter hypothesis may be true. 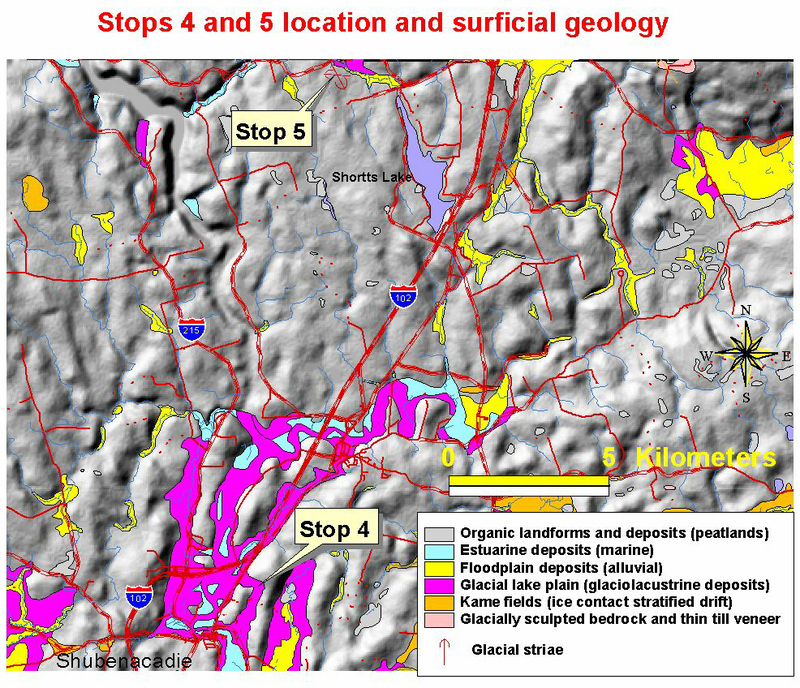 If so, Unit 1 represents deposition from the second phase of Glacial Lake Shubenacadie between 10.8 and 10 ka. (Note: For more info read Stea and Mott, 1989; Mott and Stea, 1994; Stea and Mott, 1998).